Time to begin making some comparisons and then try to determine if the coyote reduction plan in Maine is flawed or its success or failure is based on uncontrolled circumstances or both. Let’s first examine last year’s coyote report of the number taken as of February 27, 2011. There was quite a lot of hoopla when this report came out. What we discovered was that 89 coyotes were killed in 9 designated killing zones at a cost of $106.00 per coyote. However, the blame for this was laid squarely on the lack of snow and the Maine Department of Inland Fisheries and Wildlife stating that because of no snow, the deer were not in the deer yards and as a result there were no coyotes there to kill deer. And that was the ONLY reason. In addition, $50,000 had been appropriated for coyote culling and less than $10,000 of that had been spent as of February 27, 2012. Virtually no more money and effort was put toward coyote control. 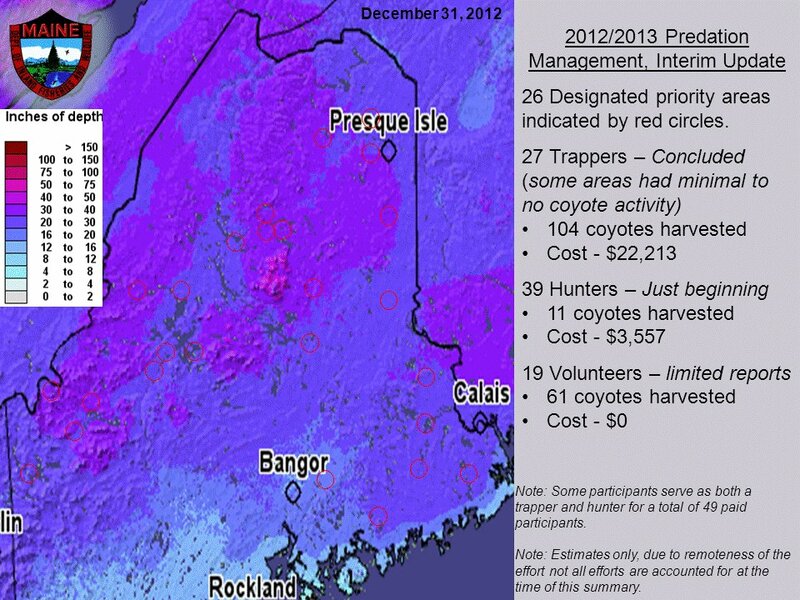 As of December 31, 2012, the trapping phase of the coyote control program was completed. It entailed 26 designated killing zones, with 176 coyotes being killed at a cost of $25,770; or $146.00 per coyote. The graphic below shows that information. So what’s the deal? 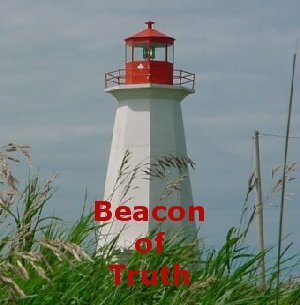 Are the deer in the yards? Is there enough snow in the 26 designated areas to force deer into the yards? Are there any deer left to go into the yards? Have deer adapted more than we want or choose to believe and aren’t using these traditional deer yards, having been forced out by predators or other reasons? 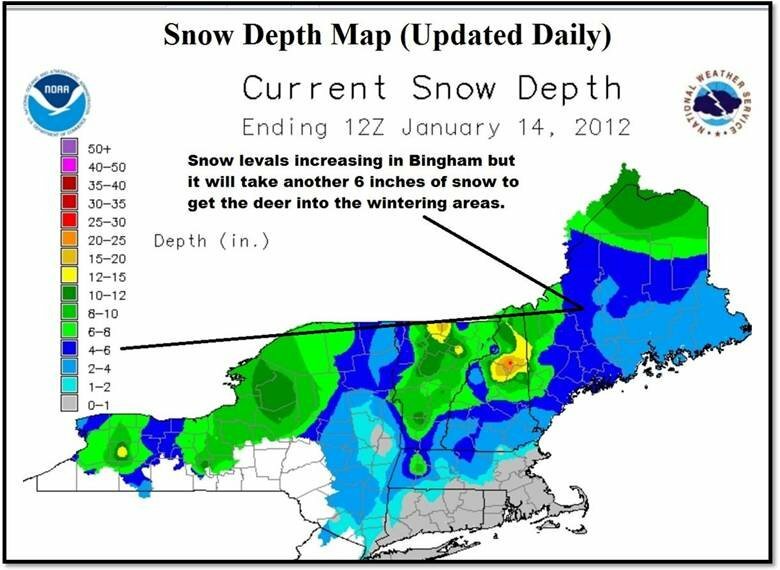 Last January 14, 2012, the National Weather Service compiled the below map showing snow depths in Maine. 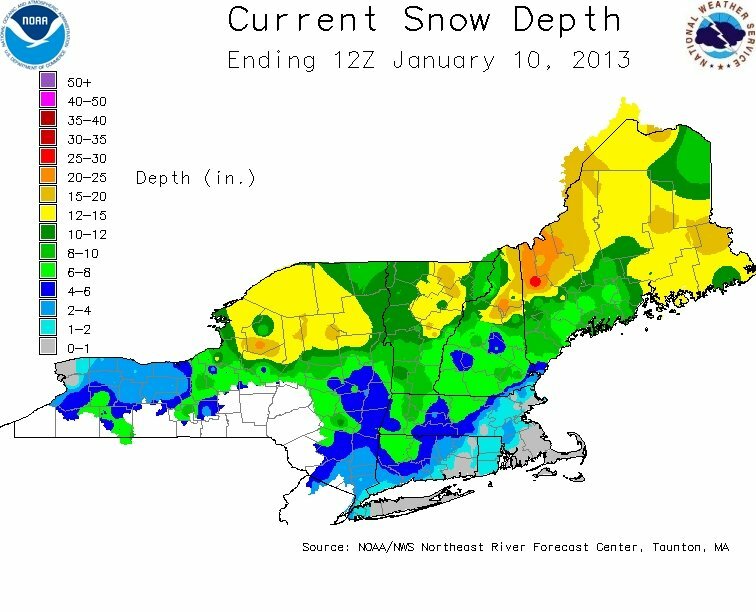 The next photograph, also from the National Weather Service, shows Maine’s snow depth as of January 10, 2013. Even though the hunting phase of the coyote control program is just underway, with 11 taken so far, can we attribute the increase in coyote kill to the increase in number of designated areas from 9 to 26? Can we attribute this increase in an increase in snow depth, driving more deer into the yards? Or both? Clearly the snow depth charts show an increase in snow cover; in some cases substantially. I have communicated with one trapper, who is part of the program of paid trappers, who said snow in his area of coyote trapping was up to his waist. But he also noted that even with this amount of snow, few deer can be found in the traditional deer yards. Why? 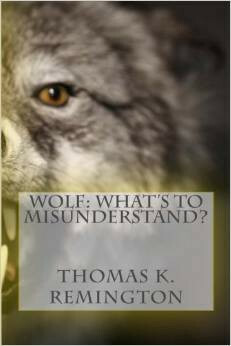 Aside from the debate of how many coyotes are being killed, we must examine more closely the cost associated with this. The cost of killing one coyote jumped up $40 per animal. 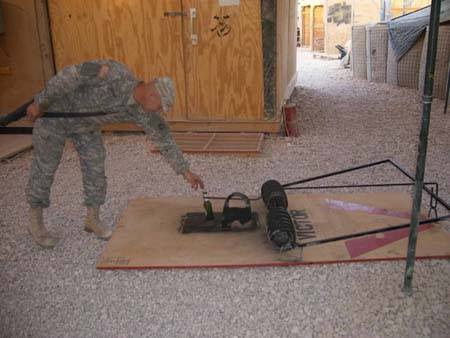 How can this be explained and/or justified? Last season the complaint was the ridiculous cost of this government program, along with lack of success, and it was suggested by many that if even half that amount was paid to each trapper/hunter for taking one coyote, the kill numbers would have shot up drastically. 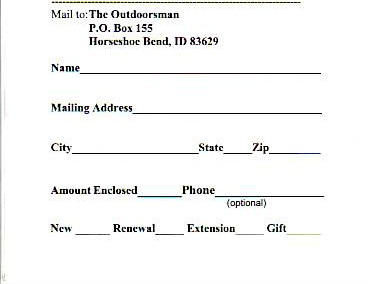 But now with this increased cost, one has to seriously question whether the program is designed to kill coyotes or to appease a few hunters and trappers.